The Bumpster Baseboard Bumper/Duster Vacuum Attachment, As Seen on T.V. Home » Christmas Gifts for the Home » The Bumpster Baseboard Bumper/Duster Vacuum Attachment, As Seen on T.V. Prevent all those scratches, scrapes, and dings on your furniture and baseboards this holiday season with the Bumpster Baseboard Bumper/ Duster Vacuum Attachment! This remarkable gadget is designed to protect your furnishings from the damage that can occur by bumping into them with your vacuum. As an added bonus, this attachment serves as a duster as well! The Bumpster is designed for use on virtually any type of vacuum, and the installation process is a breeze. Simply clean the front and sides of the vacuum head with the alcohol swab that is provided and allow it to dry. place the adhesive strip across the front of your vacuum, and attach Bumpster. Next place the side adhesive strips in place and you’re done. It’s really that simple! 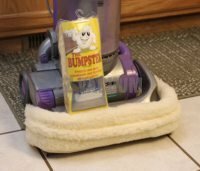 The Bumpster Baseboard Bumper/ Duster Vacuum Attachment is machine washable and dryable as well, and is designed to hold up to multiple launderings. Removing dirt from your home without worrying about causing damage is now within your reach with Bumpster Baseboard Bumper/Duster Vacuum Attachment. You’ll be swept away by the convenience of this innovative creation this holiday season and for years to come! Order yours today!